You guys, I'm so glad that February has arrived as the start of this year has been a crappy one. My partner and I have both been ill for the best part of January and we had to say goodbye to our beloved house bunnies last week which was utterly heartbreaking. In the spirit of focusing on more positive things I thought it was about time I got to sharing one of my planned maternity capsule garments and the first of my #2018MakeNine projects, the 'Mama Bettine' maternity pattern by Tilly & the Buttons which I made a few weeks ago. First up let me say I'm not in love with this one. 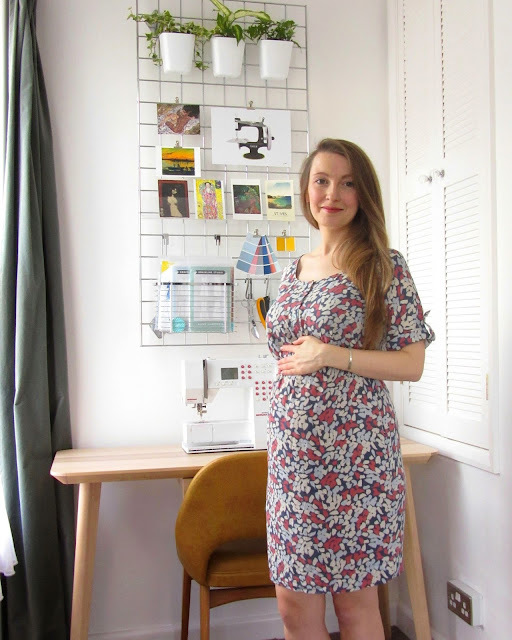 It's not so much a critique of the pattern, likely that I'm simply not at ease with my changing shape but potentially also a classic case of poor fabric choice (a little too much print coverage for my pretty minimal taste). I feel a bit like a potato with limbs. 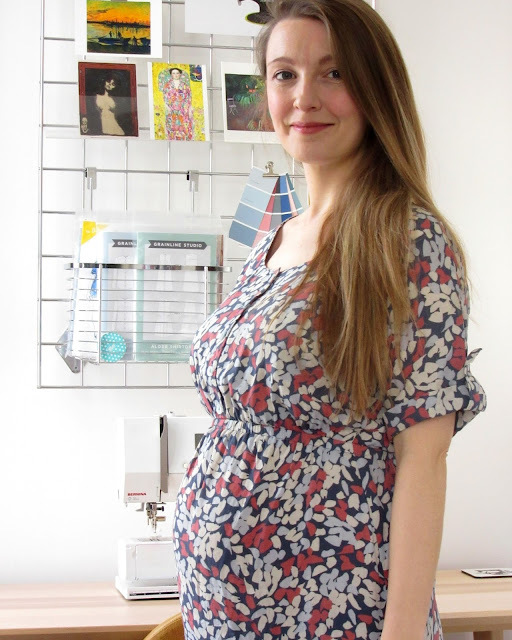 Using my new body measurements, I cut a straight size 3 and due to my recent 'Baby Brain' (is that really a thing?) leaving me extremely short on concentration not to mention energy I chose to make no alterations whatsoever and hope for the best. A little 'Danger Sewing' if you will. I was anticipating all sorts of shoulder issues and neckline gaping etc. but I'm happy to report that this one was pretty good off the bat. I chose to include the button front for longevity with nursing in mind. The only tiny change I made was to the facing treatment. I simply overlocked the edge to avoid bulk then edgestitched rather than topstitched the facing edge for a cleaner look. 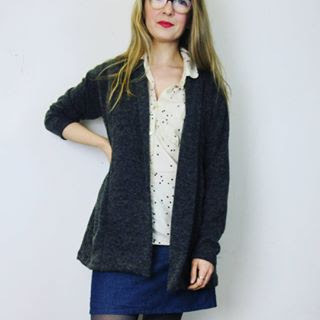 I rolled the neckline edge slightly and caught the facings at each shoulder seam with a few hand stitches to avoid it showing (and it does lay smoothly when I've not been too lazy to press it I promise!). The fabric is gorgeous 'Blossom' viscose by one of my absolute favourite fabric houses, Atelier Brunette. A word of warning, I pre-wash my fabrics harshly to avoid any laundering hiccups further down the line (my partner has a tendency to 'Help' with the laundry) and was horrified by the faded result with my first yardage, so stick to a gentle 30 degree and don't be tempted to tumble. Where this fabric is concerned heat is not your friend. So as I said I'm not really in love with this dress though I really want to be. I shortened the skirt a good 4" as I felt there was just too much coverage to be flattering and I'm tempted to cut off and re-attach the cuffs and button tabs onto shorter sleeves to further help with this. The fit has improved in the weeks since I finished it and I have a feeling that as I get larger still it may really come into it's own. Regardless, it's filled a much needed gap in my wardrobe for semi-smart teaching appropriate attire (and super comfy!). On a different note, huge thanks to everyone who's helped me with my Instagram destash over the last few weeks. 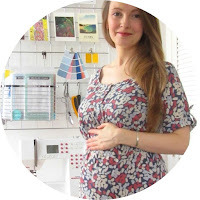 I'm almost at a point where my new(ish) sewing space is finished and organised (you can see a sneaky peek in the photos!) so you can expect a little post on that shortly. To a better month ahead ...Happy sewing friends! It does look lovely, although it’s so annoying not to be in love with a project as soon as you finish it! I hope it will grow on you though as it really is gorgeous!